Certain LTS communities consist of properties that are bound by a Homeowners Association which are offered through a Pennsylvania Offering Statement. Do not sign anything without first obtaining a Public Offering Statement. This solicitation is not intended as an offer to residents in states where properties are not registered. Home photos shown here are of LTS Homes, custom built for LTS homeowners, and may show upgrade features that are not on the standard plan. 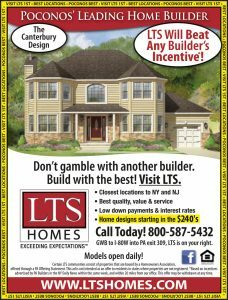 Please ask your LTS Sales Representative for details. This is a limited time offer and may be modified of withdrawn at any time. *LTS Will Beat Any Builder’s Incentive promotion cannot be combined with any other offer and may be modified of withdrawn at any time. We know exactly what it takes to achieve quality construction, and we’ve had long-standing relationships with some of the best suppliers in the nation. We will beat any builder’s incentive.